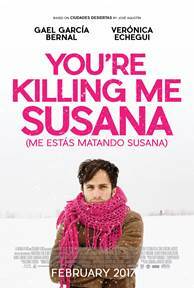 "You're Killing Me Susana," the new film with Gael García Bernal and Verónica Echegui will also be in theaters on Feb. 17, 2017. This film follows Eligio (Gael), who wakes up one morning and realizes that his wife has suddenly abandoned him. After learning that she has enrolled in a writing program at an Iowa University, he decides to go after her and persuade her to return to him.